One of Europe’s premier series. Audi and BMW resume battle. Mercedes AMG have pulled out, but there will be a presence of sorts from Aston Martin, which is an interesting development. New “Class 1” rules come into effect as part of a close partnership with Super GT in Japan. Germany’s top series expands to ten race events again, the first time at that number since the series switched to 2 races each weekend. Once again it will be a battle between three big German marques, Audi, BMW and Mercedes AMG. It will be the final season for Mercedes AMG who will depart for Formula E at the end of the year after 19 seasons, having been present since the rebirth of DTM in 2000. 2018 is set to be the final year of the current rules package, in 2019 there will be new rules closely aligned with Super GT’s GT500 cars. 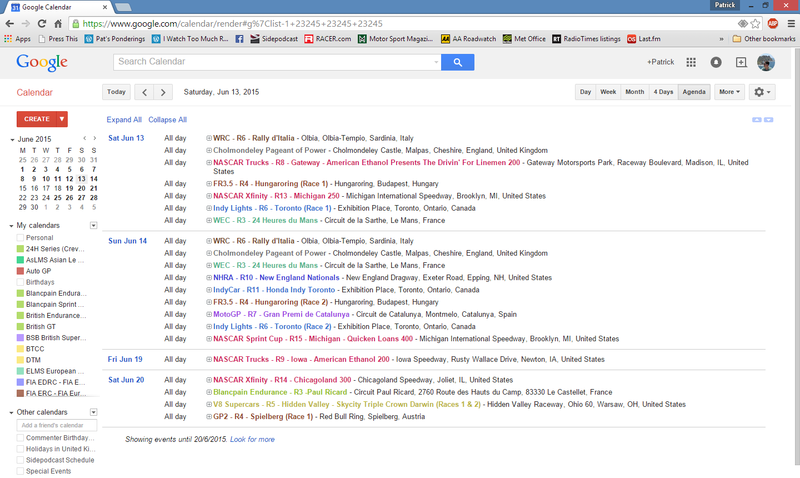 During the 2009 season I thought it would be a great idea to create a race schedule in Google Calendar featuring different racing series. I was busy with accounts studies at the time and I never got around to taking it further. Early last month I decided it was worth exploring so I set up a trial with F1 and IndyCar dates. I’d add more later if I decided it looked okay. Again I let it drop when other things got in the way. Christine from Sidepodcast recently created a calendar highlighting F1 events and the SPC / F1 Minute podcast schedules and she did a great job, enough to inspire me to get on and finish my idea. My schedule includes F1, F2, GP2, IndyCar, Le Mans 24hr, ALMS, LMS, MotoGP, WRC, IRC and WTCC. I’ve also put in Dakar, Goodwood and a couple of other things. I’ll add NASCAR Sprint Cup and DTM soon – there are categories already so if you add them the events will hopefully appear in your calendar automatically. Christine’s calendar is F1-specific and it includes Free Practice, pre-season testing and car launches. My calendar includes none of these things, only qualifying and race. I highly recommend adding Christine’s F1 calendar if you would like this extra information. Click the “+GoogleCalendar” button to add to your own Google Calendar account. I have split events by race series so you can just pick the ones you want. I think there is a way to get them into iCal and other systems, though I don’t know how. The calendar is set to UK time because that’s where I am and that’s most useful to me. I’m not sure but I believe when you import it, it will adjust it to your own default timezone. Have a play with it and see. Race start times are estimates apart from F1 and Le Mans. This information is surprisingly hard to find. E.g. IndyCar.com only lists TV start times, not race starts. Many sites only give the dates and I’ve had to improvise. Then there’s the issue of timezones which I may have got wrong. I plan to make each forthcoming weekend as accurate as I can, beyond that just use this as a guide. I’ve included qualifying for F1, Le Mans 24Hrs and IndyCar (times estimated). I don’t intend to include any more qualifying. I hope you find this useful and please let me know if there is anything you would like to add. If the demand is there and I think it warrants adding, I’ll do so. I’m already considering Indy Lights. As you can see I’ve also added a list version to the sidebar. When I create the new site I will have a version similar to the one above on its own page. EDIT – WordPress does not allow embeds so I have linked them on the sidebar. This means you can pick and choose the series you are interested in! 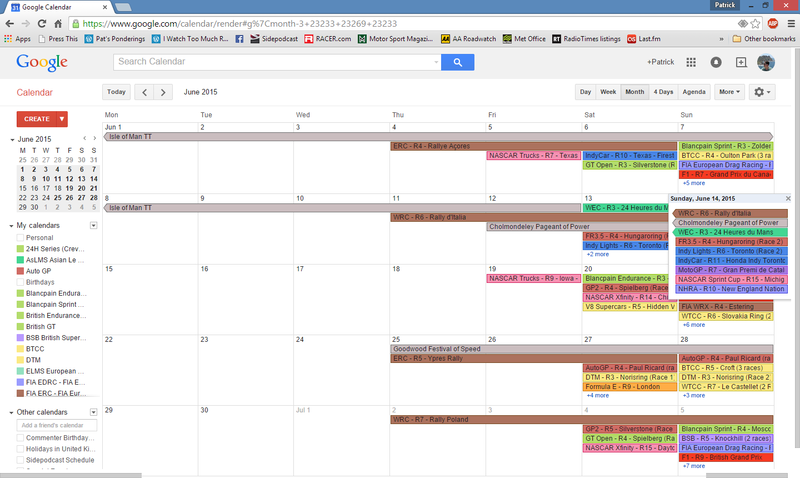 I’ve also since created calendars for Indy Lights and GrandAm. It is about time I resurrected the old ‘On The Limit’ feature, where I either link to or post here a motorsport video on anything that takes my fancy. I’ve been negligent in updating what was supposed to be a regular feature. The reason I bring this up now is the appearance of a clutch of season highlights videos, both official and unofficial, appearing all over the web at this time of year. One of the best of these was found by Scott from the Zero Downforce blog and is an artistic and really rather good look at the 2009 DTM season. I don’t care if you don’t like DTM or that it is mostly in German, it is a high-quality piece of work and well worth a look for any fan of racing in general. Scott found it so I asked him to post it to his blog rather than steal all the credit here, so I urge you to watch this video by clicking here RIGHT NOW! If you find a great video, if they are highlights or just a fantastic bit of car control, post it to your blog and I can include it in this series. Let’s get a bit of inter-blog linkery goin’ on. Last weekend we had the German F1 GP, the 9th race of 17, and either due by design or coincidence this week sees the German MotoGP, also the 9th race of 17 but this time on the opposite side of the country to the Nurburgring over at the Sachsenring circuit between Dresden and Leipzig. Support races are live on Eurosport and the BBC Red Button from 9.30am. The long hiatus to allow teams to compete at Le Mans – and recover – is finally over! This is a 2h45m event on the little Lime Rock circuit which last year was just a little bit frantic! Slightly fewer cars this year of course, but those up front will be trying just as hard. UK fans if you want to follow this event live I suggest listening to www.radiolemans.com instead! Should be at 7 or 8pm Saturday? The annual visit to Holland for the Germans appears likely to receive no UK TV airing following the collapse of Setanta Sports, as unlike GP2 no other broadcaster has stepped in to pick up the rights. There should be live streaming on www.dtm.tv though! It is due to kick off at 1pm UK time. No TV deal here either for the same reasons as DTM, although I’m a little less bothered about this one! There is a 30 minute update at 10pm Sunday on Eurosport, otherwise coverage seems as patchy and randomly-timed as ever. I think that’s everything, if you spot anything I’ve missed or if you are attending any of these events be sure to leave a comment! For those in the UK who missed the Goodwood Festival of Speed show on Tuesday, it will be repeated on ITV4 on Sunday at 5pm – don’t miss it!